A sense-provoking, 4-hour journey into Athens’ culinary scene, with more than 15 tastings of real Greek food that will make your taste buds tingle the entire time. What better way to explore Athens than eating your way through it? With an in-the-know foodie guide, you’ll enjoy 15 (!) tastings of the Greek cuisine as you walk through the non-touristy neighborhoods of Athens, to meet vendors and learn about traditional Greek recipes. From crunchy phyllo pies to cold cuts, and from stuffed tomatoes to loukoumades, your taste buds will be tingling the entire time. Big tip: come hungry. Thee food tour with Greeking.me was a unique experience. Not only did we learn a lot about Greek food traditions, but she also kept us informed about Greek history and culture. Throughout the tour, Elena always made sure we were fine with everything and pointed out important sights which we passed on the way. The food stops we made all offered delicious and authentic Greek cuisine and friendly service. Such an extrovert personality, you cannot not like her! This tour was an incredible experience! It was not just a food tour. Elena used food as a way to teach us about the culture of the city. I felt like the day before, when I toured the Acropolis, I learned about the history. And with Elena, I learned about the Athens of today. What a fantastic pairing! The instructions for the tour say to show up hungry, and they are not kidding. We tried so many different kinds of foods. What a day! We went on three tours with Greeking.me and can not fault the wonderful staff or itineraries. Excellent communication from office staff when making the bookings as well. Vera and Alina were extremely knowledgeable, friendly and attentive- we can not recommend them enough! So much better to do small group tours than hanging off the back of a mass group! Very nice Athens for Foodies walking tour. Unusual way to discover the town and its areas. Elena is a great guide, who enjoys doing her job and happily shares her knowledge about Greece and greek food. Well organised, customers are taking care of. We just completed our walking food tour and had a chance to explore places we would never have found on our own. We very much enjoyed the tour, the company of our tour guide, Tiama, Elena’s friend, and her recommendations. This is a must do experience while in Athens if you are a true foodie. What a great “food” tour guide!. Four hours of food, fun, and great company. Elena has a wonderful passion for all things Athens and brings that passion to the tour and all the various food venues. Come hungry! Thanks Elena for such a great tour! In addition to being a great food tour, it serves as a great introduction and orientation to the different areas of Athens. Elena was warm and passionate about providing a great food experience. She went the extra mile and provided the names and places of all the foods we ate and where we ate them! Book the tour and go while you are hungry, you'll be glad you did. We have done food tours in other cities and this was by far the best. Our guide met us at our hotel and we walked and ate for the next 4 1/2 hours. She was extremely knowledgeable, helpful and friendly. The tour was designed for our needs and wants and was outstanding. Great introduction to the center of Athens. It was just the guide and the two of us. The Gastronomy tour was spectacular! Penelope was very accommodating and knowledgeable about Greek cuisines. We loved going to all the best pies, Koulouris, grilled meat places, shops we wouldn't have found by ourselves. She even went out of her way after the tour to take my kids to the best ice cream shops and walked with us how to get back to hotel. She also followed up with an email on where to get the best Christmas cookies! She's the best. She's a great example on how nice Greek people are. We booked the Athens for Foodies tour and spent 3-4 hours with our lovely guide Penelope. This tour is excellent value with numerous stops to sample Koulouri for breakfast, Greek pies, cheese, olives, meats and dessert. We visited the colourful central market and neighbouring shops specialising in spices and olive oil. Penelope was also an archeologist and was able to provide lots of information about the city and its buildings and sights. We were lucky to have friendly and curious food tour companions. Would definitely recommend as a lovely way to explore the city. Definitely do not eat breakfast first! 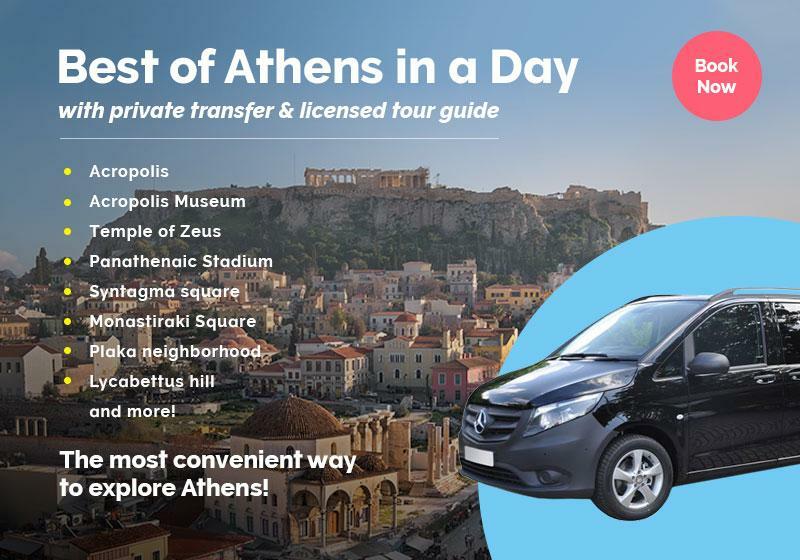 Starting from Syntagma Square, where the heart of Athens beats, you will begin a journey through the taste of Greece that you won't forget anytime soon. After meeting your food-loving guide, set off on an exploration that will introduce you to the local culinary scene. In this 4-hour experience, your guide will share with you insights into the enduring history of Greek food and the local culture. Starting your day with a traditional phyllo pie from a family-run shop, you will be lead to hidden culinary gems inside the city that only locals know about. You will visit many different food and pastry shops, off-the-beaten-path taverns & traditional restaurants, while you will also explore the Athens Central Market, the center of Athens' gastronomy life. Traveling with an expert local means nothing will get past you. You'll learn why food is a special element of Greek culture; the variety of fresh and organic ingredients that the Greek land provides us with during each season; how different spices have different uses and what makes Greek cuisine so special. Featuring 15 delicious tastings like dolmades, pastourma, feta cheese and the famous Kalamata olives, you'll get to escape the crowds and taste the best of what Athens has to offer. Unlike many Athens food tours, you won't just be sampling mouthfuls. "Athens For Foodies" is a 4-hour Greek gastronomy tour, where you will taste traditional Greek recipes -always fresh and seasonal- followed by the favorite treat of the ancient Olympic Games winners! We warn you not to eat breakfast & guarantee you there will be no room for lunch! We CAN provide food substitutions for vegetarians and we can customize the tour to include gluten-free options. Please send us an inquiry for a private tour. The tour is available in English (in small group or private version) and in Spanish, German, French and Italian as a private experience. Prepare yourself for an exciting food tour & don’t forget your hat, sunglasses, sun-block and a bottle of water. Βring along your camera so you can capture the most beautiful spots of the city. Needless to say that wearing comfortable shoes is an absolute must! The meeting point for the small group tour is at Syntagma Square. A pick-up from your hotel can be arranged for private tours. Please send us an inquiry. No. The costs include a 4-hour walk with an enthusiastic food expert and all food tastings! We guarantee you will not need lunch at all. The "Athens for foodies: A Greek gastronomy tour" is available as a private tour, in order to further customize your experience to fulfill your specific needs & expectations. Simply tell us your preferences in the booking form below.